The Button Project is coming to the Heritage Centre, Macclesfield. Launched as part of the Barnaby Festival Visual Arts Trail the exhibition will feature hand made buttons from hundreds of different artists and designers. It will begin on the 14th June and run until August 8th 2013. The project is being organised by Victoria Scholes a glass artist, curator, writer and organiser of lots of other brilliant events such as the "Glass Games" inspired by the Olympics. "When love and skill work together, expect a masterpiece" John Ruskin. Expect some mini masterpieces from the skills and patience of the contributors... details and gallery of some of the buttons can be seen here. During my degree I worked a lot with buttons and the details of clothing and amassed a collection of buttons in every material, from every era. I was inspired by the details of these historical garments and ways they could become contemporary pieces. The button, such a tiny addition to a piece of clothing could easily be overlooked as just a fastening device but is a vital finishing touch, a sign of quality utilised to add interesting detail. Couture designers such as Schiaparelli commissioned amazing sculptural buttons that were more like pieces of art made by skilled artisans, and Coco Chanel's "double C" button is as iconic today as ever. In modern times they are often used to customise clothing by those who want to make their off-the-peg purchase more individual. The fact that all of these different artists were coming together to be linked by this format is really interesting, each producing their own take and showcasing their creativity. For this new project I again started thinking about what a button represents. Communicating who we are through what we wear is as important today as it has ever been. From the choices we make between ethically made pieces or cheap sweat shop bargains, second hand, vintage or the finest bespoke tailoring... colour, style, how much flesh we reveal, it is our first impression we make on the world. Through researching buttons I always loved the brass ones from military clothing. The symbols and animals would often represent a regiment giving the wearer a sense of belonging to a group; to be worn with polished pride. These are like signet rings but for clothing. As far as traditional jewellery is concerned, the seal/signet ring is a very old form of identity. 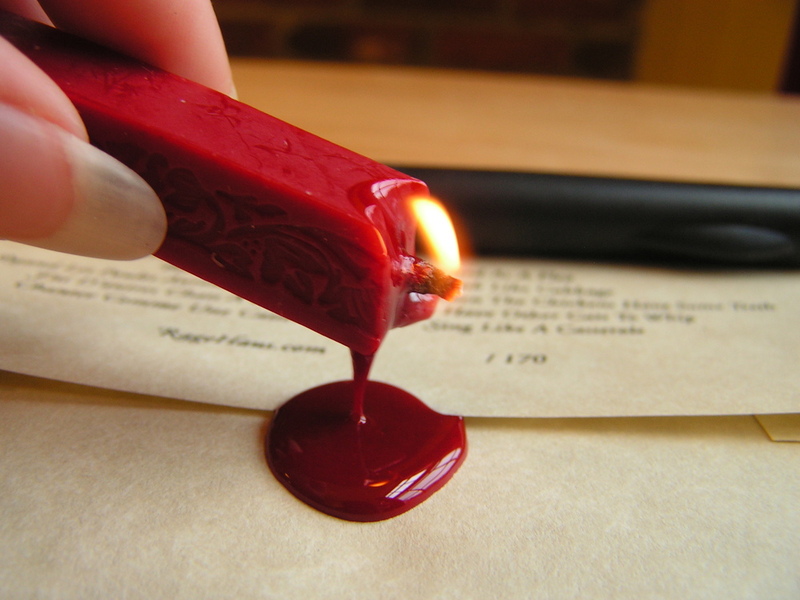 The wearer would use it to protect their privacy when sending letters and documents, to make sure they were sending their own unadulterated words, tamper proof by the wax seal being intact when it reached its destination. Combining these ideas I wanted to create a Trompe L'oeil button appearing to be a wax seal. The imprint was made using a brass button, being the individuals insignia. Talking of communication, it is also Stationery Week! As we feel taken over by technology overtaking us, the lost art of letter writing and the paraphernalia involved can become decorative objects. National Stationery Week is a celebration of the written word and all things stationery. "We want to get more people putting pen to paper and writing by hand more often...Some would have us believe that letter writing and writing by hand in a digital age is dead in the water and no longer matters but as all stationery devotees know, nothing could be further from the truth! The truth is, technology has merely distracted us from the joy and importance of writing, it hasn’t replaced it. Today, stationery and pens are also the new must-have fashion accessory – it’s where fashion meets function! There is something special about stationery, and receiving a handwritten letter or card."